My weird time slip thru Evansville, IN told to Ian & R. Gary Patterson! This one below has been unexplainable to me for 40 years. Was it time travel or an all common "time slip"? A gain in my time line? This wouldn't happen again to me in a million years! Edited this date as noted below: I told the year this happened to Ian and Gary Patterson that it was during 1974; it was the next year. My last post contains this story heard via Sound Cloud as told on Coast to Coast Live with Ian Punnett. Rod's song ended with The Faces drummer's drum beat finish at light twelve. In the 45 -50 mph speed zones I needed to be going nearly 100 +* mph for this to happen I only went the speed limit as usual. After this happened my only thoughts north of the city were, "Now, just how cool was that!" This took years to set in about what may have happened. My wife and I started the song in the same spot five winters ago, and didn't get half way through. With light traffic it took us nine minutes. I've never heard a longer version of "Stay With Me". Neither had rock n roll mysteries author, R. Gary Patterson* on the premier night for Coast to Coast Live's radio show as a guest of Ian Punnett 27/1/06. Ian has since moved to Phoenix, Arizona, but the C2CAM ad breaks still use his introduction back to the show on the radio station you are listening to. During our conversation I asked Gary the question: "Gary, have you ever heard a longer version of "Stay With Me"? Gary quickly said, "Not me! No!" When I introduced myself to Ian and Gary I had mentioned I wanted to make a comment about The Doors rock band. Near the end of my few minutes telling this strange story I forgot to bring up my Doors statement. Coast to Coast AM: 2 years later I got this in as the last caller to host George Noory and R. Gary Patterson! This true livestock hauling account of mine was "just weird" and now it's at a place where it belongs. By being registered as my fact inside Linnea's Fantastic Forum. And for posterity if for no other reason. I hear this song a few times a week. So here is your chance to ride along with the music and my International semi-tractor's possum bellied Fruehauf brand trailer load of Kentucky farmer's pigs way back in 1975!! I know kbot is familiar with my much too quick, KY pig truckin', all green light's story and if others are familiar with this post please say so here. Some may have heard me that night talking to Ian and Gary on the premier program of Ian's "Coast to Coast Live" the night of January 27, 2006 around 11:45 PM. In my intro to this strange story I gave a shout out to Fantastic Forum, Linnea and Spike Mike if that helps any active member who might have been tuned into Ian's new show that lasted just a few months. This story was placed here in Paranormal's "Best Practices for Time Travelers" topic now lost in the dreaded "Dark Pages"! I did exchange several posts with FF member drnewel. He, like me, was unable to understand my experience! *In that link noted inside in one post my wife and I tried to calculate the speed I needed to average to do this, something like 62 + MPH, but I think that was way off the mark! Last edited by Malaria_Kidd II on 01-01-2018 11:26 AM, edited 9 times in total. Re: I knew I'd post this brief note this morning! Fresh from the UK today! It's been some years since I repeated my time line vs mph vs distance check. Last night the new Freightliner loory had a nice digital screen showing lots of miles on the "trip" odometer. So I pushed the button on the steering wheel and cleared it to 0! I had my CD ready to play The Faces iconic rock song in my topic and I touched play. Due to the Toyota plant's release of some good drivers and some very bad drivers , that's life eh?, I kept my loory @ 50 miles per hour northbound not wanting to impede them headed toward their homes. Right at 4.1 miles the song's drum beat finish sounded off just like it did long ago going under U.S. Hwy 41 and State Route 57's last stop light North of Evansville, IN. I remember that like it happened yesterday. USA edit: Noted above here my miles driven with my long ago "scraped" out loory and it's long ago "scraped" out 40' possum bellied tandem wheeled trailer (3 decks in the middle) was 7.1! I got a quick chill again doing that..............again. Mentioning knowing the big Fruehauf "bull wagon" was scraped and melted down in a junk yard unknown to me. Does an occasional beer or energy drink you buy inside aluminum cans taste like something from "down" on the farm? Always look before backing your vehicle. I wished I had done so to prevent an on going urge to tell thousands of alternate news forum visitors that I had not looked behind me! So was I just lucky or did I miss something other worldly right next to the border of the Great Smoky Mountains National Park? Look what transpired on my end of the Internet after being up all night! Last edited by Malaria_Kidd II on 01-25-2017 11:15 AM, edited 3 times in total. Re: Weird time slip thru Evansville, IN told to Ian & R. Gary Patterson! If you are familiar with where I frequent in dusty UK alternate news web sites. You'll see my occasional fresh actions when the dust gets deeper where I've posted. My full semi trailer load of Kentucky pigs are still a great memory to me that long ago night traveling through Evansville, Indiana! Pink Floyd - Pigs - straight off their Animals album! Renewed video! - Edited in September 30, 2016 as noted below! I just spent over 40 minutes looking for the Black Moon! With my field glasses in both hands I walked all around for a clear view of the night's sky and I never saw it Early Saturday morning at 1:11 AM is when to watch for it. Watch for it? They forgot about including Friday night! Last edited by Malaria_Kidd II on 09-30-2016 02:05 AM, edited 2 times in total. Thanks Riddick for the dust off. With me not understanding a word she sang to the dancing men. That reminds me of a whole load of porkers squealing loudly to their tightly packed fellow pigs on their way to to the meat packer. Transported on a day where it's 95 in the shade. If you can post the lyrics to "Time warp hog style" maybe that would help. Failed embed........ but the big space shows it's ready and willing to be embedded! Last edited by Malaria_Kidd II on 03-20-2016 01:46 PM, edited 1 time in total. I guess you've never seen The Rocky Horror Picture Show? I must live a sheltered paranormal life like most of us Riddick. I've only heard about it if that counts. But thanks for the enlightenment knowing no pigs were killed or injured during the filming of this (that) motion picture. I watched it just now in an edit not noted below. It must be a well known musical. I must catch the whole movie on You Tube, if it's posted there. At least the 007 James Bond nemesis Bloefeld got to work again! I think I saw actress Susan Sarandon sp? too. Whatever happened to me and the adhered to speeds limited traveling pigs that night as a time warp/time slip WAS a great night to remember forever more! Editing this entry into post #1 was an option. But wait. This unexplained time slip was on page 2. I call page 2 the beginning of the dreaded Dark Pages. Here's my call into the premier of the short lived Coast to Coast Live program hosted by Ian Punnett. His guest that night was R. Gary Patterson who long before my call had already read my very first rock and roll mystery. I've got more for the members and bashful guests to read and hear at Linnea's Fantastic Forum under an infrequently visited Paranormal. So close your eyes and let's go back in time for my strange all green light pass* through Evansville's Dixie Bee Line on U.S. Highway 41 North! Thanks again to our son here is that call transferred from an old cassette tape to Sound Cloud. In closing, Believe It or Not. *I must note here some facts about pacing your speed by your auto or big rig helped you make the lights on green inside the city proper. The city's traffic controllers set it up for better efficiency in travel. But when waiting side traffic on north triggers the pavement's embedded magnetic sensors at other intersections your chances of stopping are obvious. But not that night as I time traveled to The Faces "Stay With Me" something weird worked it's wonders so fantastic that this one trip still chills me to this day! Last edited by Malaria_Kidd II on 01-01-2018 11:30 AM, edited 1 time in total. I finally got this told on the radio to Ian and Gary two years after I'd posted it here. Like I've noted above this was posted in a Time Travel thread where Dr. Newel and I exchanged many posts. He'd asked lots of questions with his interest in my story and neither of us had any good answers for it. I think this was found back on Dark Page 14 under Paranormal. So if any active Moderator would like to delete this old post linked below it will be OK with me. That way this true story won't be here in three places! Re: My weird time slip thru Evansville, IN told to Ian & R. Gary Patterson! As a meticulous researcher, Dr. Ben Tippett, crunches the numbers on time travel using his own TARDIS. Also, a weird new material could be the real-world version of a flux capacitor. How about just employing a large 1969 International "bull wagon" made of steel, with 18 large rubber tires, and lots of tall structured aluminum safely containing an estimated # of 180 Kentucky pigs. Throw in 12 stop lights in 7.1 miles and 1 synchronous iconic UK rock song and that was all I needed to travel in time! Boy oh boy It's a rare time when I can bump my true time travel story. Thanks to the news column on Coast to Coast AM's home page this evening that news was all I needed. Heck fire! I just time traveled again since the date says May 1st and it's still April 30th! Low and behold I'm bumping this one again! Guess which guest was on Coast to Coast AM last Saturday night (5-6-17) hosted by Richard Syrett? Tune in if you are a Coast Insider member! Dr. Ben Tippett was very realistic about time travel but only if we have the right materials some day in the future to make the time machine! One of the last open lines callers did mention D.A.R.P.A. and it's young Project Pegasus time traveler Andrew Basiago. A University of British Columbia professor has researched the real possibility of time travel and says it's all too real. Dr. Ben Tippett created a formula based on Albert Einstein's theory of general relativity, which states that huge cosmic objects like stars and black holes distort space and time. In the second half of the show, he explained how a recent detection of gravitational waves created by distant colliding black holes confirmed Einstein's theory of time travel. MK II It seems like I had the right materials for "the machine"
Hosting May 26, 2017 Coast to Coast AM - Dave Schrader who also hosts his own show "Darkness Radio" started the show noting a long time guest's untimely passing. In the first 20 minutes, Dave welcomed Chris Jericho from the heavy metal band Fozzy, who honored rock and roll historian R. Gary Patterson, who had just passed away. When any beloved Coast to Coast AM frequent guest passes away the host begins the program noting the loss. As I heard Dave lead up to the name I feared it was my friend without hearing the name yet. It was rock and roll mysteries historian, and noted author R. Gary Patterson. Gary had read everything I've posted under Paranormal related to the mysterious side of rock and roll. That premier night on Coast to Coast Live with Ian Punnett. Gary had seen this too quick livestock trucking trip through Evansville, IN 4 years prior to my call! He was so positive on everything I sent his way. I was first to tell Gary about America's first song of inspiration after September 11, 2001. Last night's show's sad note was the longest obituary I'd ever heard on the show! Long before I told this publicly about my too quick of a trip through Evansville, IN on US Hwy 41 N, the Dixie Bee Line. My long time and now late friend R. Gary Patterson had read it in e-mail. Years later I told it to Ian Punnett and Gary on Ian's Premier of Coast to Coast Live on Saturday nights. The show just lasted a few months. In response to my bizarre "time slip" Gary e-mailed me this line, "Just like Robert Plant you were a traveler of both time and space." Not another living soul interested in the paranormal world could have sent me a better response. Rest In Peace R. Gary Patterson. One more thing before this thread starts drifting well into the Dark Pages of Linnea's stead fast Fantastic Forum. Just before I departed this dusty, but fairly well viewed paranormal forum, I deleted 7-8 threads. I was proud that I had garnered their good lines on other topics I had contributed as seen under my raven avatar who's quoted repeating "Never more"! Here is the link where there are no posts and it contains a link to Scotland's Unexplained Mysteries also where there are no comments. I know Doka had noted here to me 2 years back that it's better staying zip lipped when it comes to personal paranormal happenings. Yep, she was right about that! But it was a bit tough for me to do that. I do believe Riddick's posts above is the only posts I ever received in the States, where it can still be read. In the UK on mysteries forums it was much different where the active members tried to explain it, but could not fully explain this time slip anymore than I could. But at least they gave it their best shot! Last edited by Malaria_Kidd II on 12-31-2017 01:00 PM, edited 1 time in total. Re: Lady You Tube Member Talks "Time Slips"! On contrary to this lady's explanation for "time slips", I went forward in time with a large load of live pigs who never had a clue they'd went through it too! Two Famous Time Slips She begins talking about her time slip at 2:25. Then afterwards she brings up two more from Liverpool, UK. If you've had a similar experience let us know. Wish me better luck on the next embed, eh? Who Needs A DeLorean When You Drive A Big Rig? GREAT SCOTT! 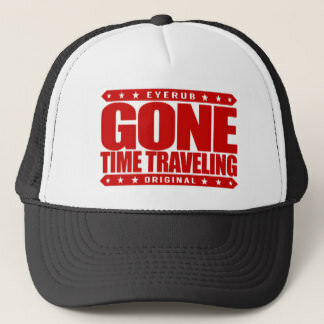 Hey Now MK II, how better to commemorate your once in a million years slip-thru tick-tock trip than with a time machine trucker hat!